Our Reach – FoodWIse works out of county Cooperative Extension offices and in collaboration with state and local partners. 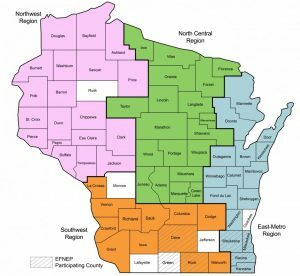 We are active in 66 of 72 Wisconsin counties. SNAP-Ed funds programming in 66 counties. EFNEP funds programming in 7 counties.